Cleopatra (yes, the original Cleopatra) travelled from Egypt to a far off future in space, where she was greeted by sentient cats, plunged into future-tech military training, and found out she was prophesized to defeat an utterly evil space tyrant warlord, Octavian. 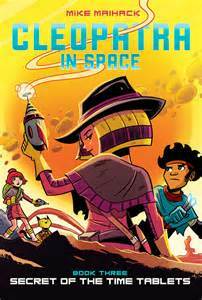 Secret of the Time Tablets (Scholastic, April 2016) the third book in the series, fills in a lot of the story, strengthening the narrative arc. There's plenty of action-filled adventure (or possibly adventure-filled action), and plenty of difficult choices to be made, and dangers with real consequences to be faced. Cleo's friends, Antony and Akila, both have nicely satisfying roles to play, and Cleo is just as impetuous and determined as ever. The story arc of finding the fabled Time Tablets holds things together plot-wise, and the illustrations bring it all to life. So basically, lots of fun, with some more serious stuff on the side. Note on diversity--Cleo is of course North African, although being from the Ptolemaic dynasty, she's on the pale side of dark skin. Antony, who's clearly a dark-skinned kid, adds diversity, and there is also now a kid with a disability--an arm lost (I think lost, but possibly just damaged horribly badly) during a skirmish and replaced with a high tech prosthetic. Just about any graphic novel reading kid will love these books. The ones who will really like this series--kids who think cats should be in charge. There was good cat page-time in this installment!